So one day last spring I was sorting my sewing room and I came upon an unfinished quilt top. It’s one I started way back when. Before I had (mostly) mastered the art of matching corners, lol. I’m not sure why I put it away and didn’t finish it. I think maybe I felt (at the time) that the colours were too bright, or maybe I didn’t like using grey for the background neutral. I really have no idea. Anyway, it was spring when I pulled it out and all the spring flowers were in full bloom. I carried it out and took some pictures with the tulips. And oh my gosh…the quilt just sang! Suddenly, every spring colour just jumped out at me, and I realized that every single colour was in the quilt. It screamed Spring! I looked at the grey background and thought of the soft spring rain that comes and melts all the snow, and makes the flowers bloom. And I thought to myself, this quilt belongs to my aunt, whose favourite season just happens to be spring. This is a lap-sized quilt made from the Cuzco collection by Kate Spain. The backing is cream flannel and it was hand quilted in a clam shell pattern. I didn’t wash and dry it before I sent it, but when she does, it will shrink a wee bit and pull around the stitches, creating that wonderful crinkly look that makes a quilt so soft and snuggly. Kate Spain, Charm Packs and Layer Cakes…. This entry was posted in Colours, fabric, Hand Quilting, Quilting, Quilts and tagged cuzco, disappearing 9-patch, hand quilted, Kate Spain, quilt, spring. Bookmark the permalink. How gorgeous! I love the colors. The quilting design is a great one for the quilt design. Love the bright colors with grey background. All the picture of the quilt among the flowers was soooo pretty! What a beautiful quilt!! I love all of Kate Spain’s fabric lines and the gray background in your quilt is perfect! Your label is the cutest! Thanks for sharing. Such detail..even the wee birdie on the label wearing glasses! 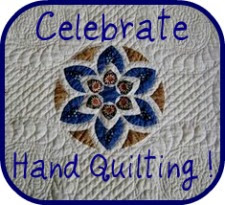 Now that hand quilting is really giving a softness that machine quilting would not be able to match..Lovely flowers too! A beautiful quilt. I love the story and gorgeous spring flower photos!! Beautiful! I will get to see it in person when mom and I travel there next month.